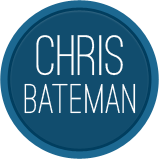 In 2013, I added a paltry 6 posts to cbateman.com. Page views increased to about 26,500, in large part thanks to my Chrome experiment. International traffic also increased – the top countries were: USA (27%), UK (7%), India (6%), and Germany (5%). San Antonio lost its pole position on the top cities list: London (1.9%), San Francisco (1.3%), Paris (1.2%), and New York City (0.9%). 82% of visitors came from a desktop computer, 13% from a mobile device, and 10% from a tablet. I am going to post more this year. Really.